Many interesting bits and bobs fall from the trees in Autumn. Gathering them is a fun activity, especially with kids. Collect the pinecones, butterflies, birds nests, feathers, flowers, dried leaves and berries. Arrange them in a vintage vessel - something low and wide. 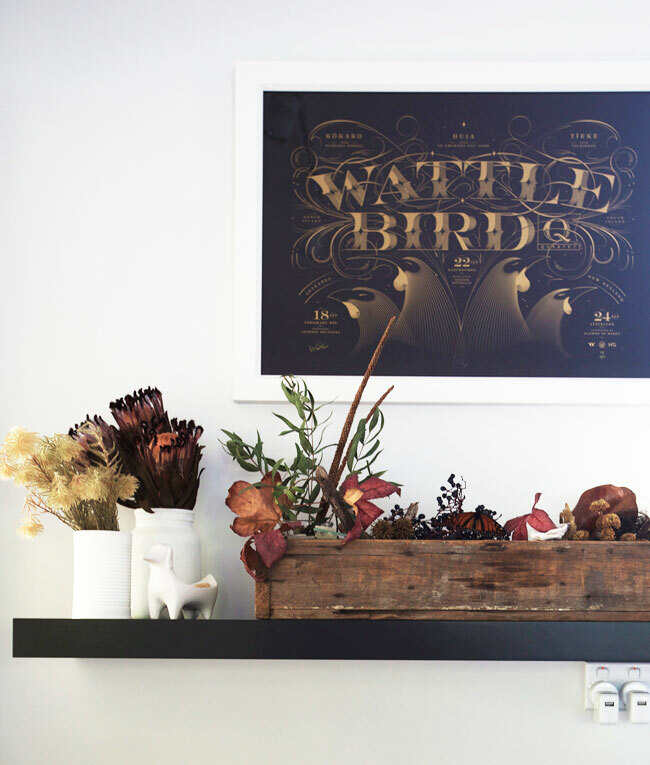 Select a spot in your home for this ‘Ode to Autumn’ and keep adding to it as the season develops. Keep colour in your life but turn down the volume on brightness. Living with colours that reflect your surroundings creates a sense of calm. Autumns colours are rich and deep. Forget the usual brown and black. Take a look outside for inspiration. Try slate blue as opposed to turquoise, mustard as opposed to sun yellow. Get rid of that manky doormat. Yes your doormat is there for you to wipe your feet., but it is also the first thing your house guests see! Before the wet season begins choose a new mat (and give the porch underneath a scrub while you’re at it). There are some really cool and fun doormats out there. My favourite are those made from woven coloured polypropylene, available at Collect Living in Barrys Point Road. Layer upon layer. As the warm nights turn cool it’s time to bring out the velvet, fur and wool. Change the linen throw for a chunky cable knit. Splash out on some cosy velvet cushions. Look out for a fur rug to have on the floor beside your bed, for those cool mornings when you don’t want your toes to hit the cold floor. Ease the pain of loosing summer by making the most of cosy fabrics and cuddly blankets. Swap the beach bags for gumboots and jackets. Ease the stress on rainy mornings by making a home for Autumns accessories. Choose a central location or a place near the door. Give each jacket a hook. Make space for the umbrellas and ensure the gumboots are handy. Take time to do a stock take before winter kicks in. And just in case you are planning a mid-winter holiday somewhere warm, make sure your summer goodies are put away clean. Light is something we take for granted in summer. However, in autumn the daylight fades faster and takes longer to wake up. Embrace the change with cool lamps and candles Use clever lighting to control the autumn mood – be it a bedside lamp for night-time reading, bright naked bulbs for the kids bedrooms or a bold statement lamp in the lounge. And stock up on candles that bring with them indulgent scents from far-away places.